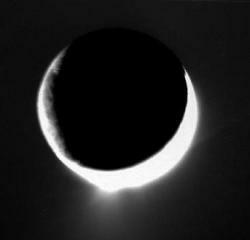 One of the biggest space news stories of 2006 was the Cassini’s discovery that water ice was spraying out the bottom of Saturn’s moon Enceladus. It could be that the tiny moon is under such gravitational flexing from Saturn that it refuses to freeze solid. Researchers then went on to propose that this spray of ice is actually regenerating Saturn’s E ring. This was big huge news, because it means there’s probably liquid water there on the surface of Enceladus, and wherever we find liquid water on Earth, we find life – no matter how cold, hot, radioactive, acidic, or deep underground. Well, a new paper published in the December 15, 2006 issue of the journal Science is proposing an alternative viewpoint for the plumes. The problem is that the plumes contain 10% carbon dioxide, nitrogen, and methane. These chemicals shouldn’t be able to mix with water at the low pressures on Enceladus. The researchers are proposing that there are reservoirs of clathrates underneath Enceladus’ southern poles. These are an ice phase of nitrogen and methane that can be much colder than liquid water. The plume of material is erupting from these clathrates, spewing nitrogen, methane, carbon dioxide and chunks of water ice into space. So there wouldn’t be pools of liquid water, and dashing hopes for life.